Gum Problems during Menopause: Consult a Doctor or Dentist? Most people's initial reaction when dealing with gum problems, at any stage of life, is to make an appointment with their dentist. However, sometimes gum problems that are caused by hormonal imbalance might require a visit to your doctor, with a visit to the dentist. Continue reading to discover when you should consult a doctor and when you should consult your dentist. If you are worried about your oral health, then the first step you should take is making an appointment with your dentist. Your dentist will be able to diagnose what is causing the problem, and whether you are suffering from a gum disease such as gingivitis. Once gum disease is diagnosed, the next step depends on the cause of the problem. There are a range of causes for gum problems, however, and a permanent solution may require to go beyond dental care. During menopause, hormonal imbalance is likely the cause. However, gum problems can also be triggered by lifestyle choices such as a poor diet, inactivity, or poor oral hygiene habits. Gum injury, fungal infections, or other underlying health conditions could also be the cause. Some of these causes, such as oral hygiene, can be remedied at home without needing to visit the doctor. However, for other causes the best thing to do is to make an appointment with your doctor too. Very often, gum problems are a result of hormonal imbalance during menopause, a poor diet, or lack of exercise, or they may be exacerbated by any of these causes. In such cases, a doctor's advice is necessary to figure out the best way to remedy the issue. If your gum problems are caused by hormonal imbalance, a trip to the doctor is particularly important, since they can provide you options for restoring that balance. Seeing a physician as well as a dentist will provide you with the right treatment options and restore your oral health. This plan may include HRT, lifestyle changes, and supplements. These supplements work to rebalance your hormones naturally by nourishing the hormonal glands and endocrine system as a whole, supporting its optimal functioning and thus reducing the risk of gum problems during menopause. Although the dentist is the first person many women turn to when they find themselves suffering when any dental complaint, often a doctor's visit is also necessary to really treat the root of the problem. By knowing when it is necessary to see both practitioners you will be able to treat and relieve gum problems during menopause in the quickest and easiest manner. 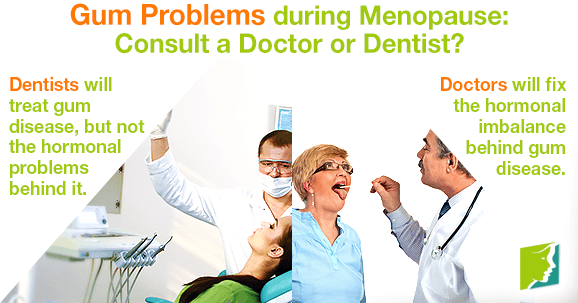 Oral health problems are a common complaint of menopause.